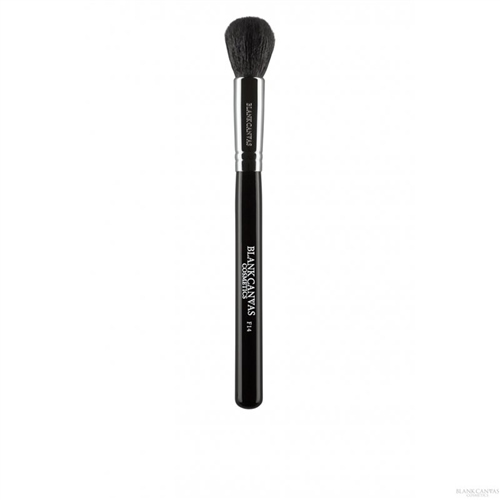 The F14 is a multi-purpose face brush from our Pro Deluxe Series. Handmade from extra soft, high quality, easy to clean natural fibres. The F14's rounded natural fibres are perfect for applying and blending powder foundations, blush, contour and highlighters. This brush is best used with powder products. Check your brush for any signs of issue on receipt. Please note that a small amount of shedding is normal during the first 3-4 uses. Use a daily brush spray to wipe off excess product building up on your brush. Deep clean when product is beginning to build up using our gentle brush soap or a shampoo. Use only very small amounts (pea-sized) of product to wash your brush and rinse thoroughly. Avoid allowing water to run into the metal ferrule. Remember: If you see product building up further than halfway down the brush head, it means your brush is being used incorrectly. Brushes that are saturated in product will not last.